If you landed on this site because you want more information about Citta Del Mar——which seems to happen quite frequently, we finally have some answers. 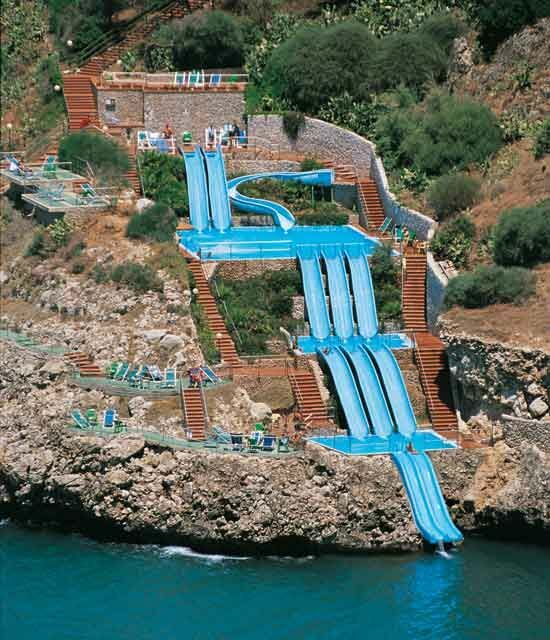 The pool features a 4-level waterslide that takes you from the hotel all the way down to the ocean. It has been on our bucket list for several years. Apparently it’s on a lot of yours too because this post, about how we want to visit (not even a site review!) has been our most clicked on, pinned, search for, talked about, and read post in 3+ years of obsessing over hotel pools. Check out this post from LuxeAdventureTraveler.com. The writer visited the resort and answers a lot of questions we (and probably you) have had. Bottom line: the resort is very low-frills and a bit challenging, but the slides are magnificent. Also, here’s a 4 minute You Tube clip of someone going down all 4 levels of slide into the ocean. Epic.